Knitted in a multiple of 9,+ 3 sts and 6-row repeat. Row 1 (Right side): * Purl 3, knit 6; repeat from * to last 3 sts, purl 3. Row 2: * Knit 3, purl 6; repeat from * to last 3 sts, knit 3. Row 3: * Purl 3, knit 6; repeat from * to last 3 sts, purl 3. Row 4: * Knit 3, purl 6; repeat from * to last 3 sts, knit 3. Row 5: * Purl 3; slip 3 stitches to a cable needle and hold in back, knit 3. 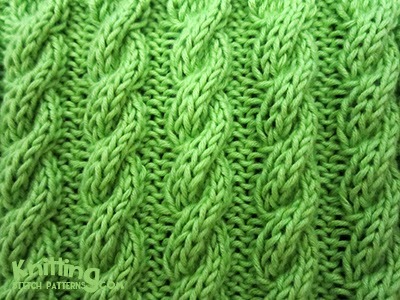 Then knit the 3 stitches from the cable needle; repeat from * to last 3 sts, purl 3. Row 6: * Knit 3, purl 6; repeat from * to last 3 sts, knit 3.